Is it too late to write that now? I suppose it is the 13th January, but it’s my first post of 2016 so it feels apt. Instead of writing about resolutions and cutting back, turning over new leaves and generally improving oneself, I’ve decided to write about inspiration. I constantly feel inspired to get in the kitchen to create new and exciting recipes and adapt recipes that have caught my attention. These plum and hazelnut frangipane tarts are the perfect example of a creation that was inspired by so many other sources. The idea for these tarts came about when I first saw these divine Cherry, Pistachio and Almond Tarts by Hint of Vanilla. So much so, I asked for the pastry rings for my birthday (which was in October, so these were a long time in the making). 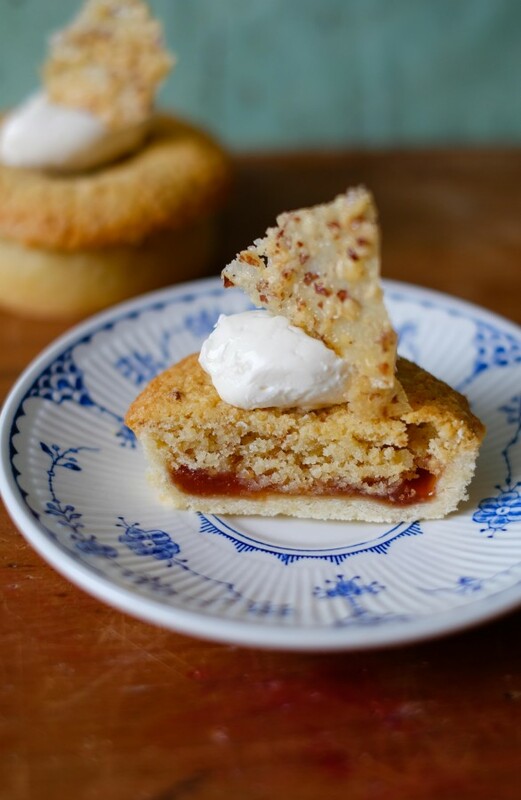 I always knew that I wanted to make something with frangipane and jam, a lot like a bakewell tart. When I was given some free plums around the same time as Domestic Gothess posted this plum and amaretto jam recipe, I knew this jam had to feature in the tarts. I followed the recipe almost exactly for this jam, the only change I made was to the alcohol, I substituted amaretto for Chambord. The pastry and the tuiles are from my absolute favourite patisserie book by William Curley. I wanted a pastry recipe I knew I could trust and for my first time of making tuiles I turned to this book. I must admit my tuiles came out a bit soft, I’m not sure if I didn’t bake them for long enough. If anyone has any advice about tuile making do let me know. The final element for this recipe came from one of my favourite food magazines – Delicious. It was originally a pistachio frangipane recipe by Richard Bertinet, which I changed to hazelnut frangipane. Part of the reason I chose hazelnuts was because I thought it would work better and I also had a bag of hazelnuts in the cupboard already! Which brings me nicely to another point, I really hate food waste and making these tarts in early January was also an excuse to use up some of the ingredients in my kitchen. The list of things I want to bake is vast, but I get so bored with buying expensive, very specific ingredients, only to use 10 grams of it and leave the rest languishing in the back of my baking cupboard. I carry out regular checks of all my ingredients, to ensure I don’t go out and buy more of something that I already have, as well as making sure I use things up that are close to date. I specifically buy smaller bags of sugar and flour – even though they often cost more per 100g – to avoid wasting them and I store everything in labelled airtight containers or ziplock bags. The freezer is also a friend of mine, I have Danish pastries, homemade puff pastry, egg whites and fruit puree which I buy in bulk and portion individually before freezing. This recipe has been inspired by lots of different recipes, the pate sucree and tuile is from William Curley's book Patisserie, the hazelnut frangipane is adapted from a Delicious Magazine recipe and the jam recipe can be found on Domestic Gothess. I substituted amaretto for Chambord though. This recipe makes 8-10 x 8cm round tarts or 1 x 23cm tart, use whatever tins you have at your disposal. Place the butter in a bowl and beat until soft and smooth, add the icing sugar and cream the ingredients together until light and smooth. Put the chopped hazelnuts in a food processor or mini chopper and blitz until they are fine (don't blend them too much or they'll turn to nut butter). Place the butter in the bowl of a stand mixer fitted with the beater attachment and mix until it is very soft. Keep the mixer running, add the sugar, hazelnuts and ground almonds, it will form a thick paste. Add the flour and continue to mix, finally add the eggs and the brandy. Mix until the whole thing combines together and then place the frangipane in a disposable piping bag and chill it in the fridge while you roll out the pastry. Pre-heat the oven to 180C Fan, if using pastry rings, line a baking tray with a silicone mat, grease the rings and place them on the mat. If using a loose bottomed tin or tins, grease the tin(s) and place them on a baking tray. Take the pastry out of the fridge, warm it a little in your hands and then roll it out on a lightly floured surface, until it's the same thickness as a pound coin or around 3-4mm. If using individual tins, cut out pieces of pastry using a knife and lay them over the tins, pressing the pastry into the sides of the tin, using a rolling pin, roll over the top of the tin and then remove the excess pastry from the outside of the tin. Gently press the pastry into the sides of the tin so that it will stay put. You will need to roll up the scraps of pastry and re-roll it to get the number of cases you need. If using one large tin, simply roll the pastry out to a thickness of 3-4mm and then lay it over the large greased tin and press it into the sides of the tin, use a rolling pin to remove the excess. Place the pastry in the fridge to chill for another 30 mins. Take the pastry from the fridge and put a generous amount of jam in the bottom of the pastry case. Spread the jam out evenly and then cut the tip off the disposable piping bag and pipe a layer of frangipane on top of the jam. Don't be tempted to overfill the tarts with the frangipane as it puffs up while it bakes, so fill the tarts to just below the pastry - you may find you have some frangipane leftover. Bake the tarts for 30 minutes or until golden and puffed up. Place 15g sugar and the pectin in a small bowl and mix together. Put the milk, 35g sugar and butter in a small saucepan and bring to the boil. Take off the heat and add the flour, mix until fully combined. Line a baking tray with a non-stick silicone mat and using a stepped palette knife spread the tuile mixture thinly, sprinkle with the chopped and roasted hazelnuts and then cover with another silicone baking mat. Bake for 8-10 minutes until golden brown. Leave to cool and then remove the baking mat and snap the tuile into pieces - this can be stored in an airtight container for 2-3 days. 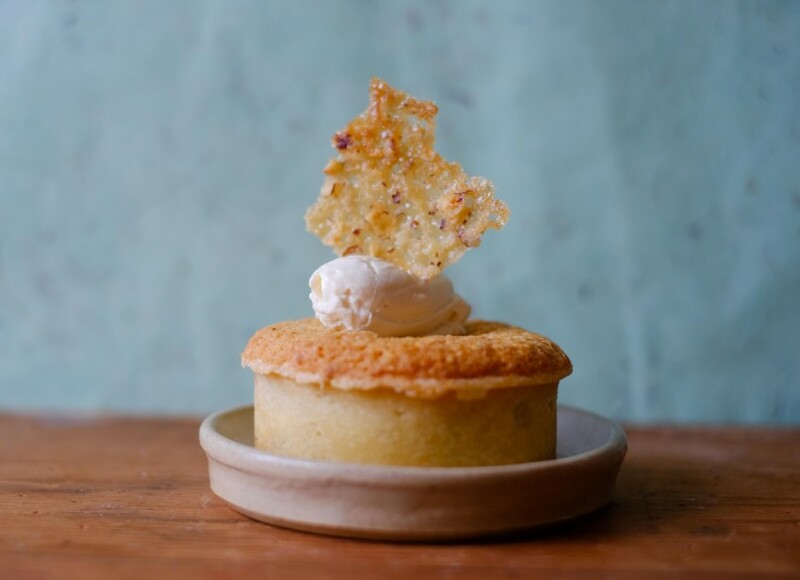 Mix the mascarpone with the maple syrup to taste and then taking a spoon make a quenelle of the mascarpone and top the cooled hazelnut tarts with the mascarpone and place a shard of tuile on the top. 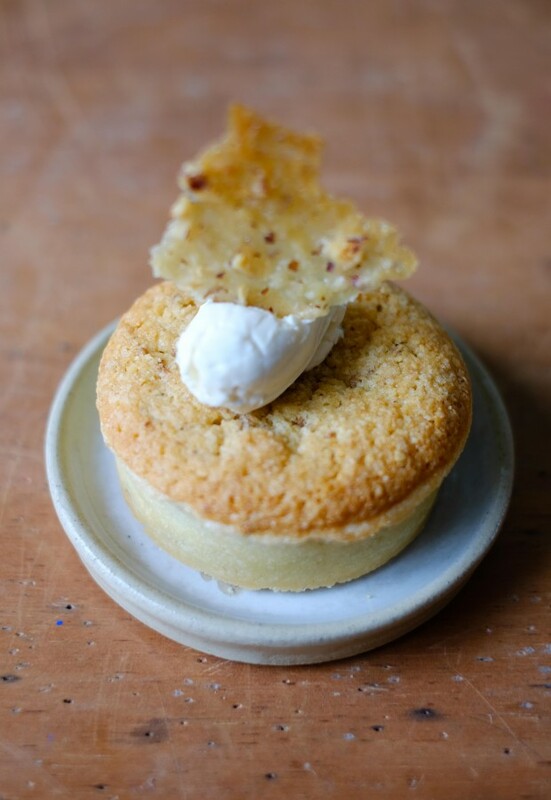 These tarts were topped with maple syrup mascarpone that I attempted to quenelle – it’s much tougher than it looks and something I need to practice. Here’s to an inspirational 2016, I hope to post lots of new recipes, using up familiar ingredients from the blog as well as introducing some new techniques and and flavours. Thank you Jodie – what dogs do you have? Talking of leftovers, I made baked meatballs last night and did a double batch – we ate one for dinner and i left the rest on the back to cool so I could freeze them and then have them at a later date for dinner. I came downstairs and my boyfriend had eaten nearly half of the portion! Men! Thanks Louise. The tuile was really hard to get right, but it makes all the difference. I love the finishing touches to your presentation! So lovely! Thank you so much Lisa. The finishing touches are what I find to be the magic of patisserie – so pleased that you noticed my attempts – that means so much. Thank you Pang. This is such a tasty tart and I loved making them and eating them! How delicious Angela, your tarts look gorgeous. What wonderful flavours! Thank you so much Lucy – These tarts are truly delicious. My goodness, Angela! I can only imagine how glorious these tarts must be. I adore frangipane! Beautiful presentation as well. Just looking at them is making me so hungry! Hannah I’m so bad for buying things I already have in the cupboard! The great thing about the frangipane is that ground almonds are still the basis, but you can change it up with different nuts. 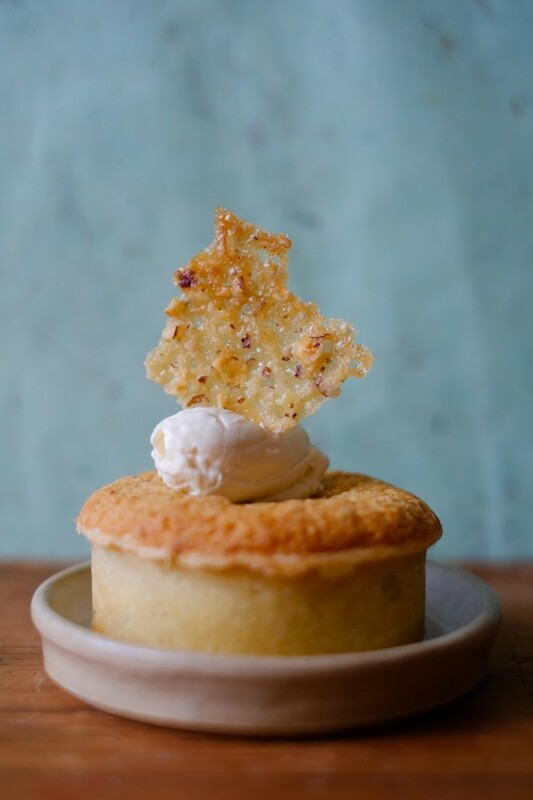 Oh how I wish that my NY resolutions included eating more tarts like this divine example. They don’t 🙁 I shall eat this one with my eyes – every delicious morsel. It looks amazing. And I would love to see how you line and use the pastry rings. I have some myself and never have the nerve or know how to use them. Thank you so much Lucy – next time I use the pastry rings I’ll provide photos. They’re really easy to use, you just need a silicone baking mat to sit them on and then the rings do the rest. I love the perfect straight sides they give you.